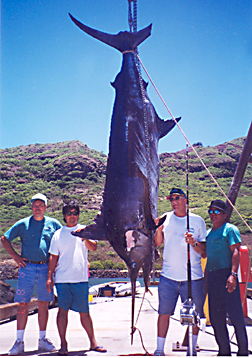 Chuck Blesso was fishing aboard the 35-foot Bertram, the POMAIKAI, with Capt. Harry Shigekane and deckhands Serafin Duterte and Florencio. The marlin ate a strawberry-colored Shiroma lure running from the center rigger position. Chuck battled the blue with a 14/0 Penn Senator reel and 180-lb test line.